Tyler Reddick will drive the Champion Synthetic Racing Oil sponsored Benic Enterprises 2B Race Car at the 2012 Chili Bowl Midget Nationals. The 16-year-old standout will make his first appearance at the 26th running of the famous “Chili Bowl, which is held the second week of January in Tulsa, Oklahoma. Reddick, who hails from Corning California, will pilot the well-known Champion Racing Oil sponsored 2B Racing Midget for the first time in his career. 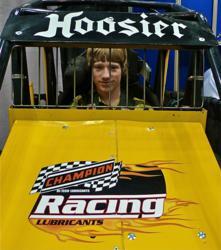 The Chili Bowl Midget Nationals is an indoor midget car-racing event. It takes place at the Tulsa Expo Center in January, two weeks after Christmas. NASCAR calls it the "Biggest Midget race of the year". It is also nick-named the "Super Bowl of midget racing". Drivers in other series who come from a midget car background frequently race in the event. Competitors like NASCAR drivers Tony Stewart, Justin Allgaier, J. J. Yeley, A. J. Fike, Josh Wise, Kasey Kahne, and Jason Leffler, World of Outlaws sprint car drivers Terry McCarl, Tim McCreadie, Danny Lasoski, and Sammy Swindell, NHRA drag racing champions Cruz Pedregon and Gary Scelzi, IndyCar drivers A. J. Foyt IV, Tom Bigelow and Billy Boat, plus numerous USAC racers. Drivers last year came from 35 US States, Canada, and Australia.